We’ve all noticed the changed landscape on the grocery shelves: eco-friendly brands like Mrs. Meyers, Seventh Generation and even Clorox’s Sierra Club-endorsed Green Works sit next to conventional stalwarts like Tide, Cheer and those ferocious scrubbing bubbles. The new products are the consumers'-eye-view into a quiet “green chemistry” revolution taking shape in university and commercial labs across the country, and in education and public policy. 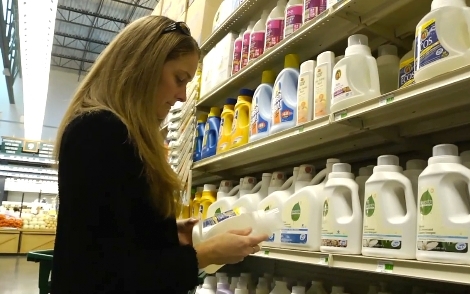 Even if the proliferation of green cleaning products, office supplies, packaging and appliances make the planet and its inhabitants healthier, the fact remains that more than 80,000 chemicals with uncertain health and environmental impacts currently are registered with the Environmental Protection Agency, with more discovered every day. “Green chemistry involves discovering and implementing chemical processes and products that are safer, cleaner and more efficient,” said John Arnold, professor of chemistry at the University of California, Berkeley, and director of the campus’s Berkeley Center for Green Chemistry (BCGC). Last month, the center hosted the sold-out event Green Chemistry: Collaborative Approaches and New Solutions,” the first national conference to take a multidisciplinary approach to this developing area of study. Speakers and panelists came from the EPA, California state government, private industry, departments across the Berkeley campus, and universities across the country, including the 2005 Nobel laureate Robert Grubbs of Cal Tech. The BCGC already has begun redesigning undergraduate and graduate student education to include green chemistry by creating greener laboratory experiments and launching an interdisciplinary graduate course in green chemistry funded by California Environmental Protection Agency. But the center aims for a broader impact – on public policy as well as on the chemical industry. “We’re trying to promote activities that address more than one aspect of green chemistry, that also look at economics, business, law, toxicology or public health,” Arnold said. Green chemistry programs are not new at universities or in the research labs of chemical companies, but most focus only on innovations in chemistry, such as developing catalysts or safer solvents, according to Alastair Iles, a UC Berkeley assistant professor of environmental science, policy and management and a center member. Iles said that these technical developments are critical to achieving sustainability, but they won’t be as effective or be widely used without also finding societal innovations in policy, law, environmental health and business. “In contrast, BCGC has a vision of integrating multiple disciplinary fields with chemistry so that chemists can work with toxicologists, business experts, regulators and economic experts to develop technologies and products that are non-toxic and sustaining,” Iles said. Center executive director Marty Mulvihill said that green chemistry is already being taken up by industry because it’s cheaper, it doesn't produce as much waste, it uses less energy, and it creates products that are safer, without the worry over what's going to happen at the end of a product's life. “It just needs to be taken up by the entire industry in a transparent way that gives businesses and consumers the information they need to make choices,” said Mulvihill. A key 2008 study led by UC Berkeley environmental health scientists and their UCLA colleagues, formed the technical basis for the state’s Green Chemistry Initiative and new legislation authored by Senator Joe Simitian (D-Palo Alto) and Assemblymember Mike Feuer (D-Los Angeles). Those new laws, and their implementing regulations, could improve public access to information on the sale of chemical products in the state and reductions in some uses of the most toxic chemicals, according to Michael Wilson, BCGC associate director for integrative sciences and an environmental health scientist at UC Berkeley's Center for Occupational and Environmental Health. As members of the state’s Green Ribbon Science Panel, Wilson and his co-author Megan Schwarzman, the center’s associate director of health and environment, have worked with the DTSC to shape the Green Chemistry Initiative, with the hope that it will improve transparency and accountability in the chemicals market.